The First and Fourth amendments to the U.S. Constitution took center stage Tuesday when the Maine Supreme Judicial Court convened at Westbrook High School to hear oral arguments. Students heard an appeal from a former prisoner who claims his right to free speech under the First Amendment was violated when he was disciplined for a profanity-laced statement he made to a guard. They also listened to lawyers debate whether a defendant’s Fourth Amendment right to be free from warrantless searches was violated when police located him using information from his cell phone service provider. In this case, the justices asked lawyers to address whether a recent U.S. Supreme Court decision affected Maine law. 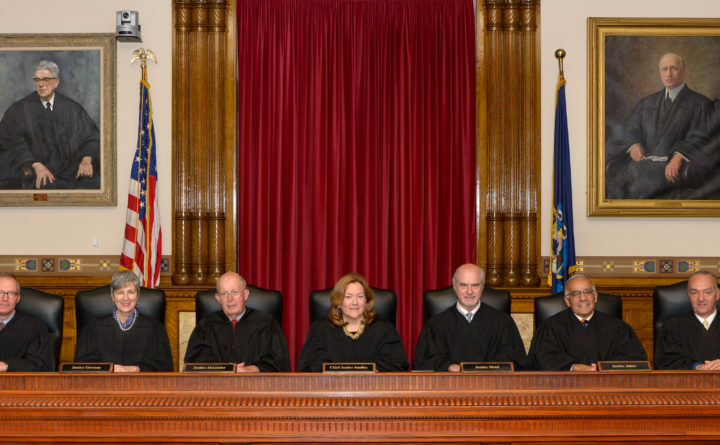 The state’s highest court has convened at high schools around the state since 2005. On Thursday, it will visit Wells High School and next year, justices will meet at the recently completed Sanford High School. In addition, the justices will hear oral arguments Wednesday at the Cumberland County Courthouse in Portland, where it convenes most often. In the First Amendment case, Scott Dolan, a third-year student at the University of Maine School of Law in Portland, argued that Maine State Prison inmate Edward Arbour’s response to being awakened at 10:30 p.m. Dec. 16, 2016, for mail delivery was not harassment as officials at the Warren prison concluded following disciplinary hearing. After being awakened, Arbour said to the corrections officer: “doing f***ing mail at 10:30 at night, this is f***ing bulls***,” according to the briefs. The guard filed a disciplinary action after Arbour told him, using more profanity, that he could not threaten to withhold a prisoner’s mail. Assistant Attorney General James Fortin argued for the Maine Department of Corrections that prisoners don’t have an unfettered right to free speech the same way people who are not incarcerated do. Fortin also said that guards could not let challenges to their authority go unreported. Justice Andrew Mead seemed to agree but expressed concern about what speech toward a guard should and shouldn’t be allowed. Dolan said the record was complete enough for them to reverse the prison’s disciplinary action against Arbour. Information about why Arbour, 39, of Whitefield was incarcerated was not available Tuesday. He is no longer in the custody of the DOC as a prisoner or a probationer, according to the department’s website. In the cell phone case, Kevin O’Donnell, 29, of Lisbon was convicted of an April 2015 burglary and theft in Rangeley, according to briefs. The victim identified O’Donnell as a possible suspect. The investigating officer, without a warrant, had O’Donnell’s cell phone provider locate him by pinging the phone. O’Donnell’s attorney, Adam Sherman of Auburn, argued Tuesday that it was an illegal search. In June, the U.S. Supreme Court found that a warrant was needed for police get seven or more days of location sites if they wanted to track a cell phone’s location to establish a suspect’s travels. The high court did not address whether a warrant was needed under federal law to obtain fewer than seven locations. Assistant Attorney General Paul Rucha on Tuesday urged the court to find that Maine law allows cell phone location evidence obtained without a warrant to be admitted as evidence. The latest U.S. Supreme Court does not apply in O’Donnell’s case, he said. “We win the case just based on that fact the Supreme Court left it an open question,” he said. O’Donnell would like the court to rule that the evidence gathered by being able to locate him be suppressed. He also would like to withdraw his guilty plea and go to trial. O’Donnell is not in the custody of the Department of Corrections as a prison or probationer, according to the department’s website. The American Civil Liberties Union, its Maine chapter, the Maine Association of Criminal Defense Lawyers and the Electronic Frontier Foundation signed on to a “friend of the court” brief in support of O’Donnell. There is no timetable under which the justices must issue their decisions.